As soon as we found out we were expecting (again), I nervously started envisioning a life for our little one. I felt a sense of wanting to “do” something to prepare and help the pregnancy to feel real, like this IS happening. Prior to knowing if we were having a little boy or girl, I knew I wanted to cultivate a calming space; somewhere that we could retreat with our little babe that would feel cozy but also be classic and timeless. 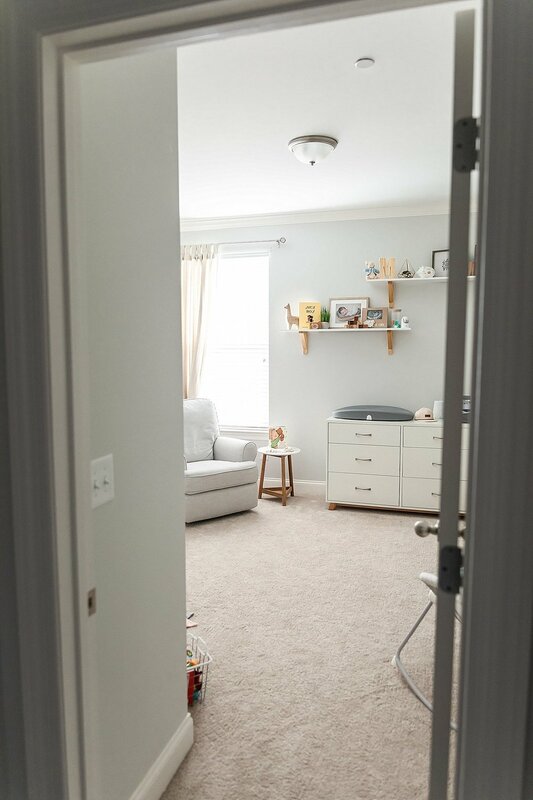 Rather than heading in the direction of a true “nursery theme”, I started envisioning a room with grey and white, textures, and then would add in touches of other colors after we learned the gender. We found out our little one was a boy in the fall of 2017 and I instantly knew that I wanted to add in touches of wood tones. It started with the vision of raw wood, but as I picked out different details, it ended up being a collection of a variety of different wood tones; in the end, I think it all came together perfectly! In going with this direction (lack of a true theme) I also hoped that we could carry some of the pieces from his nursery as he grew up, offering a little bit of sentimental value to the pieces over time. Guess when we moved in?! Anyone remember when my son was born? Yep! You guessed it. Sharing the nursery with you is extremely postponed because of our move-in date, birth date, birth/c-section recovery, new mom adjustments, and then busy season with the most amazing clients. SO, here I am now sharing how Mason’s sweet nursery came together. It is by far the most put together room in the house (which has been totally ok by me! But I am ready to work on making the rest of our home “homey”..) and my favorite space i’ve ever actually created myself. A lot of love and gracious gifts from family and close friends made Mason’s room possible and it makes me smile thinking about all of the hands that went in to the items that really made the space so perfect. Thank you to everyone who gifted us items for our sweet boy! The entire space started with the beautiful crib. I fell in love with this crib while nannying for the most amazing family. Once their little girl outgrew her crib, they were kind enough to gift it to us to share with our boy. The history behind it makes it that much more precious to me. That being said, I’m not sure where you can find it, but i’m told it’s a Jenny Lind style crib for anyone on the hunt for a crib! I have to admit, I somehow got in my head that I wanted a “hey handsome” pillow for Mason’s room. Despite knowing that it cannot stay in the crib when he sleeps, I knew I could utilize it in other ways in his room (the glider, future tee-pee I envisioned for the space, etc.). I hunted HIGH & LOW for one that I liked. They either were the wrong color, I didn’t like the font, or they were too expensive. I finally found this one and cannot wait to see how we can utilize it as he grows! Pillow | The Little Birdie Pillow Co. I am absolutely obsessed with how his shelves came together. This was a great way for me to pull different wood tones together. A lot of these items have such sweet sentiment behind them. I’ll start with the “hello little love” sign; this is one of the few things that Jonny picked out for Mason on his own. We were at Hobby Lobby looking for ideas when he saw & picked this out. I had absolutely no idea what we were going to do with it at the time, but it was the sweetest thing to me that he picked out something, I couldn’t resist. I’m so happy it found a perfect spot on his shelf for all to see. (And I can’t wait to share that story with Mason when he’s older). To keep the details and info on the lighter side, I’m only going to share a few of the special things on the shelves! The shelf brackets were made by my Father-in-Law, the piggy bank was gifted to us at a shower by my Mother-in-Law, the bunny was gifted to Mason at a shower by my Aunt (Mason’s Great-Aunt), and the “so loved” frame was given to me early in my pregnancy from the family I nannied for; I don’t even think I knew at that time that I would be including wood tones into the nursery, but it couldn’t have fit any more perfectly. Target doesn’t carry the exact book ends anymore, so I linked something similar! When thinking about what I wanted from the nursery glider nook, I knew I wanted somewhere to sit a bottle and a chair I could sit cross legged in. I kept it simple and still love it! Mason’s cap is the one he wore home from the hospital. We waited to announce his name until he was born, and this was one way we used to announce his name! I was lucky enough to find this sweet, soft hat at a consignment sale last spring & my dear friend Stacey embroidered his name on it for me. Other than that, you’ll see a couple of his favorite teethers here! When it came to a reading nook, I wanted to be able to display the books on the wall (rather than a traditional book shelf). 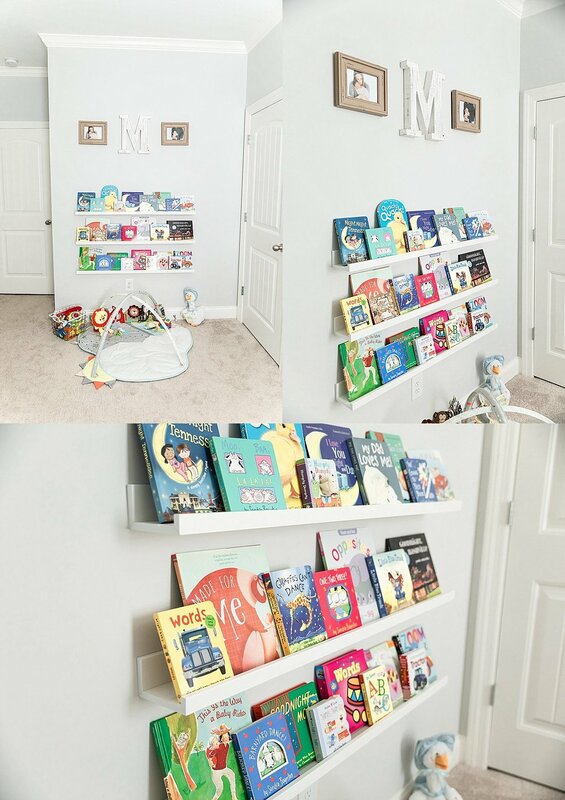 I have loved watching Mason scan these shelves and smile because he can see the fronts of so many books! In fact, he often gets distracted while burping to smile and reach for a book. I hope you enjoyed it and found some inspiration for your little ones too!